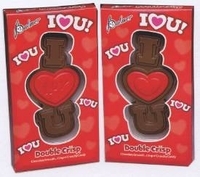 What a way to say I love you , then with this Valentine chocolate. Each gift box is solid milk chocolate that says " I heart U ". A perfect Valentine treat. We carry a large selection of Valentine candy to let that special someone know just how much you love them. Pick from chocolate puppy love, chocolate lips, Happy Valentines Day heart. What ever you want to tell your loved one we can help.